Grimm & Co, the innovative literacy charity that brings a truly unique retail offering to Rotherham's High Street, has received a fantastic review following a visit from the writer who pioneered the concept for engaging with local schools. Opening in a former pub in 2016, the award-winning Apothecary to the Magical sells wild schemes, evil plots, charms, curses and kitchenware. Above the shop, the Yorkshire charity runs innovative storytelling and writing workshops for children in the local area, to unleash their imaginations and build confidence, self-respect and communication skills. 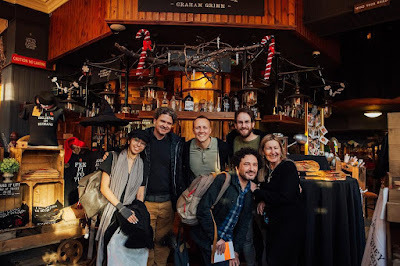 Dave Eggers, the Boston-born author whose 2008 TED Talk and own non-profit organisation was a big influence for the founders of Grimm & Co, was in Rotherham recently to take in the magical venue for the first time. The writer's work includes The Circle and A Heartbreaking Work of Staggering Genius, and he created 826 Valencia in San Francisco in 2002. 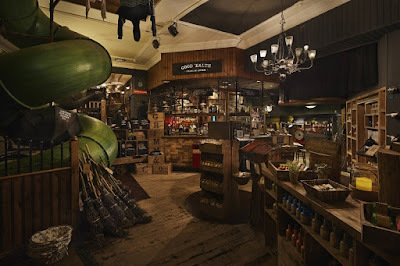 It has spawned similar organisations across the globe where in each case, the shop is a façade, and although they sell products, like any other, it is all part of creating a fantastical destination to inspire children to work without knowing they are working, and increase participation in literacy projects through a creative writing and mentoring centre. Writing on Instagram, Eggers (pictured, second left on the back row) said: "I finally got to see it in person: one of the most gloriously lunatic youth writing centers in the world, Grimm & Co. It's located in Rotheram [sic], about two hours north of London by train. In the middle of town, in a former pub, Deborah Bullivant and her team have created a complete and utterly convincing alternative universe dedicated to storytelling and pure wonder. "I was there for two hours and I barely scraped the surface of this place, with its secret doors, miles-deep mythology and backstory, hundreds of bizarre products, stories all over the walls, kid-made books, and of course the writing room where student-writers gather around a very official table and sit on toilet seats. "This place is worth the trip from London, or Leeds, or South Korea. It is simply that great, and is unsurpassed in all the world." Converting the former Town Gate pub on Doncaster Gate at the foot of the High Street, the centre above the shop has attracted thousands of young people for story-making sessions, school writing programmes, after school clubs and holiday camps. The unique workshops are free for children so the charity, which relies on volunteers, must continually work to raise funds. The apothecary shop and website supports the charity, with all proceeds going towards the running of the workshops. The charity is also supported by writers and celebrities with the story behind Grimm & Co (Graham Grimm was a Yorkshire businessman, born 1148, just before lunchtime, who spotted a gap in the market), was written by Jeremy Dyson (pictured, front), a non-acting member of the League of Gentleman and co-writer of the West End play and feature film, Ghost Stories.